Walter’s mastery in two different global industries has made him an authority on peak performance. 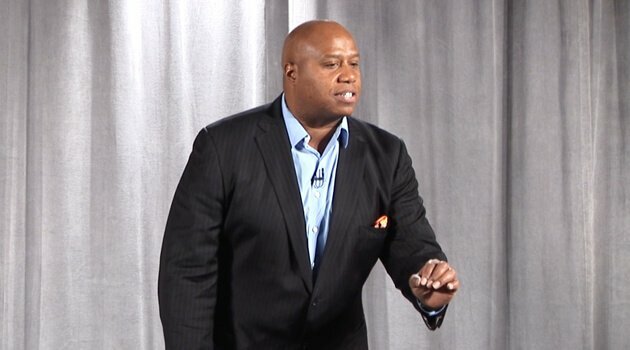 Walter has delivered his entertaining and dynamic message to companies and associations throughout the United States, Canada, Mexico, the Caribbean and Europe. Clients include Accenture, Blue Cross/Blue Shield, The Dwyer Group, Allianz, Amway, GNC, Hilton, Medtronic, UPS Store, Radio Shack, Red Robin and many national associations. Walter’s passion for personal development has been anchored by his professional basketball career. Although a reserve throughout his college basketball career at the University of Minnesota, Bond miraculously enjoyed an eight year career while spending time as a shooting guard for teams such as the Dallas Mavericks, Utah Jazz and Detroit Pistons. This is where he learned peak performance truths that he has also applied to a wildly successful speaking career. Bond’s college basketball career did not say NBA at all. Only hard work, dedication and commitment got him there. That mentality is what he wants to share with your audience. Whether it’s a new product launch, hitting sales goals, gelling as a team Bond is passionate about sharing his 31 Truths to Boost Peak Performance. In 2013, Walter appeared as the host of The Food Network’s show Giving You The Business. Walter was chosen over numerous candidates because of his infectious personality and franchise business experience. Episodes featured restaurants such as Saladworks, Famous Familia, Toppers and Jersey Mike’s.